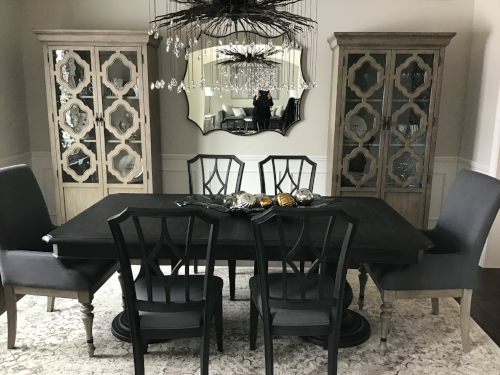 At Home Interior Warehouse, we have the privilege of offering our interior design services to homeowners throughout Southeast Michigan. 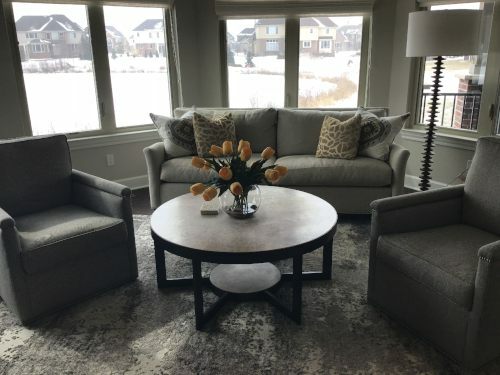 In this blog, we have a chat with Bridget M. about her experience working with our interior design team in Northville, MI. 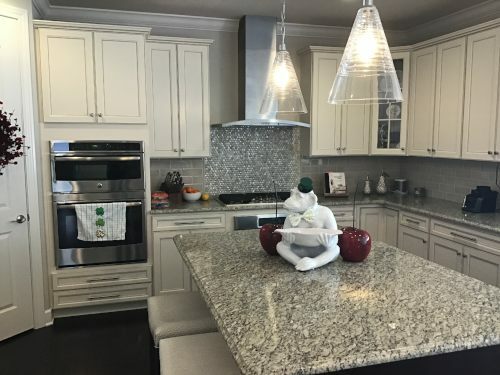 We think you’ll love how this project came together! Read on for more details. More photos below! Q. Is this your first experience working with an interior designer or have you worked with one before? A. This was our first experience and they [Home Interior Warehouse] have been fabulous. I didn’t know what to expect but it was always fun with Jackie. We always looked forward to our meetings and she made it very easy. We never felt overwhelmed. Jackie did the entire main floor of our home and the bedroom upstairs. When we left our old house we sold pretty much everything so we started from scratch. It could have been overwhelming because we don’t consider interior design to be a strength of ours but we always looked forward to the process. Everything came together very nicely. Q. What made you seek out an interior designer to help you with your home? A. We moved to a house that was close to double the size of our old house. I felt like in our old house, we’d go shopping and be looking for a ton of things and eventually settle on a couch but it would end up doing nothing for our space. We had an idea of what we like but bringing it together is hard. We don’t have the eye to bring all the pieces together. That’s why we decided we wanted an interior designer. We wanted a completely different feel from our old house. Our old house was darker and we wanted our new house to be brighter and lighter. We wanted something transitional and modern but not too modern because we still wanted it to feel warm and cozy. Jackie hit the nail on the head. People will come in and comment on the unique pieces! The design is very functional. Q. What were the main reasons you decided to hire Home Interior Warehouse to do your interior design work? A. Well, three years ago – before we ever thought of hiring an interior designer- I went with a couple of girlfriends to the HIW Holiday Open House. The showroom was beautiful and totally decked out for Christmas. I remember thinking about how much I loved all the pieces. Years later when we decided to hire someone, I mentioned to my husband that I was at HIW’s showroom before and that they do interior design. For one thing, I may like a piece from Pottery Barn but I don’t want my whole house to be from Pottery Barn. That’s what I liked about Home Interior Warehouse. My whole house wouldn’t be a single brand or type of style. We met with Jackie and looked around and really liked her and her style. She even came with us while we were building our new home and we loved what she had to say. She’s fun to work with and not pushy. She’s not pushing the more expensive pieces. She’s not like that at all. Everything at her store definitely has a cool and fun vibe to it. I like that she pulls pieces from everywhere! Q. How has having an interior designer affected your design hopes and dreams? A. I love my house! We’ve only been in our house one year since June  and I feel like we’ve been here longer because it’s all settled. I don’t look around and think we still need something. It’s our oasis. I recommended Jackie to multiple people and we’ve gone to her for holiday stuff, too. I really trust her opinion. Even when it came to choosing things like my backsplash, I would run it by her. She always knew our space and has never steered us wrong. If I had to go through the process all over again I’d choose Jackie again! Q. Did you know this was your style before or did the interior designer help you discover that? A. We wanted something bright and modern. Though we knew we wanted something brighter, we didn’t know how to make that happen. Jackie had recently moved from her house to a new build and invited us to come and walk through her own home. As soon as we walked in I knew I loved it. The chandelier she has is the one I now have, too. Whenever we went into Home Interior Warehouse we knew there was something new. It’s never static. Jackie would have us look around the store and then we’d talk about what we liked. She recommended pieces that I would have never noticed and I love them. She always has a keen eye. Q. What was your favorite part of having an HIW interior designer working in your home? How would you describe the way the interior designer listened and interpreted your design hopes and dreams? A. Very warm, friendly, and welcoming. I knew Jackie had several clients that she was working with but we never felt rushed and we always felt like we were the only client. Q. Do you have a favorite piece or favorite pieces? Why are they your favorite? A. I love my light fixtures. They add a completely different vibe to the main floor and second floor. The light fixture in the dining room is amazing. I’ve never seen it anywhere besides in Jackie’s home. It’s a gorgeous statement piece and the first thing people comment on when you walk in the door. I love that piece! I also love the TV console because it doesn’t look like a traditional console at all. It’s functional but the design and shape are completely different. Honestly, I could go on and on! See the full design portfolio here. Getting the look you’ve always wanted has never been easier with Home Interior Warehouse’s interior design services. 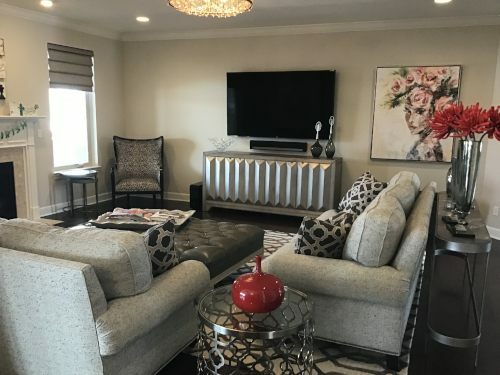 In addition to having two home decor/furniture showrooms in Southeast Michigan, our team of professional designers works on local interior design projects throughout the year. As always, our professional staff is ready to help you transform your space into the home you’ve always wanted. Interested in our interior design services? Contact us via the form below!